There are four different faucets available: Chrome plated, stainless steel, stainless steel with flow control, and gold plated stainless steel with flow control along with a variety of accessories, replacement parts and add ons. Note that availability on this offering can be touch and go. CRAFT’R has recently been sold out of this great faucet. As of this update they are available again. If you were waiting, here’s your chance. This entry was posted in CRAFTR, Draft, Faucets, Great Deals, Kegerator on March 14, 2019 by admin. Perlick 630SS Draft Faucet. Stainless Steel, Forward Seal Design. Forward Seal – smoother operation, less sticking and less chance of contamination. This is also stainless steel, that means it won’t pit over time like brass has a tendency to do. As of this posting, this is marked down to $43.99. Shipping is free with a qualifying $59 order to many US addresses. Price, promotions and availability can change quickly. Please note that product prices and availability are subject to change. Prices and availability were accurate at the time this this post was published; however, they may differ from those you see when you visit the product page. Check the product page for current price, description and availability. This entry was posted in Draft, Faucets, Great Deals, Kegerator, More Beer, Recent MoreBeer on March 9, 2019 by admin. 304 stainless steel commercial draft beer faucet. Fits American faucet shanks and has standard threads for most tap handles. This entry was posted in Amazon, Draft, Faucets, Kegerator on March 1, 2019 by admin. Works With: As of this posting, Austin Homebrew Supply is taking 13% off sitewide, with some exclusions when you place a qualifying $49 order. This sale DOES stack with many items that are already on sale. No coupon code is necessary discount will be reflected at checkout. Check AHS for current availability. 13% Off at Austin Homebrew Supply! This entry was posted in Austin Homebrew Supply, Draft, Faucets, Kegerator on March 1, 2019 by admin. Site Wide Sale: For a short time, MoreBeer is taking 15% off nearly everything, site wide when you use coupon code SPRING15. There are a few exceptions. Shipping is free with most $59 orders. Free Shipping: Shipping is also free with a qualifying $59 order to many US addresses. This entry was posted in Black Friday, Draft, Faucets, Kegerator, More Beer on March 1, 2019 by admin. Stacks With: As of this posting, Austin Homebrew Supply is giving away a free $20 gift card with all purchases of $100 or more. It also stacks with items that are already on sale. No coupon code is necessary. The promotional gift card will be automatically added to your cart when you place $100 of qualifying merchandise in your cart. Check AHS for current availability. 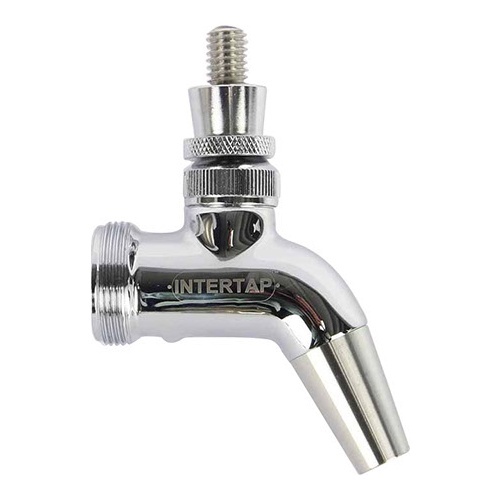 “The patented Intertap Faucets are a forward sealing faucet similar to the Perlicks. They have a modular, threaded spout which can fit a variety of different attachments including a growler filler or a stout spout. $30 Off! As of this posting, MoreBeer is discounting most orders of $170 or more by $30. Use promo code EZ30 to save $30 off qualifying orders of $170 or more. Check out our post on this sale for a large list of application ideas. This entry was posted in Draft, Faucets, Kegerator, More Beer on February 1, 2019 by admin. Stacks With: As of this posting AHS is discounting most things by a whopping 16.59%. That’s the largest % off sale we’ve seen and matches Black Friday 2018. This entry was posted in Austin Homebrew Supply, Draft, Faucets, Kegerator on February 1, 2019 by admin. Stacks With: As of this posting AHS is discounting most orders based on order size. Spend $50, get $10 off. Spend $150, get $30 off. Spend $250, get $50 off. No coupon code is required, savings will be automatically reflected at checkout.